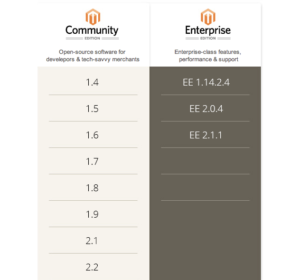 There are two primary editions, i.e Magento Community and Enterprise. Both the editions are different from each other, but offer similar features. We support both the editions – Community and Enterprise. While the Community edition is free and more suitable for all businesses, the Enterprise edition is paid but offers extra features that brings your business to an edge. If you have any of these editions in your online shopping website, you can opt for an app with our free magento mobile app builder. If you require a mobile app for your Enterprise or Community Edition, then email us at contact@magentomobileshop.com. Our app builder is compatible with all the editions and will conveniently make an app for your website in no time.